Welcome to the Home Page of the Paleontology Section! The Paleontology Section does fossils, and we do them in lots of ways. 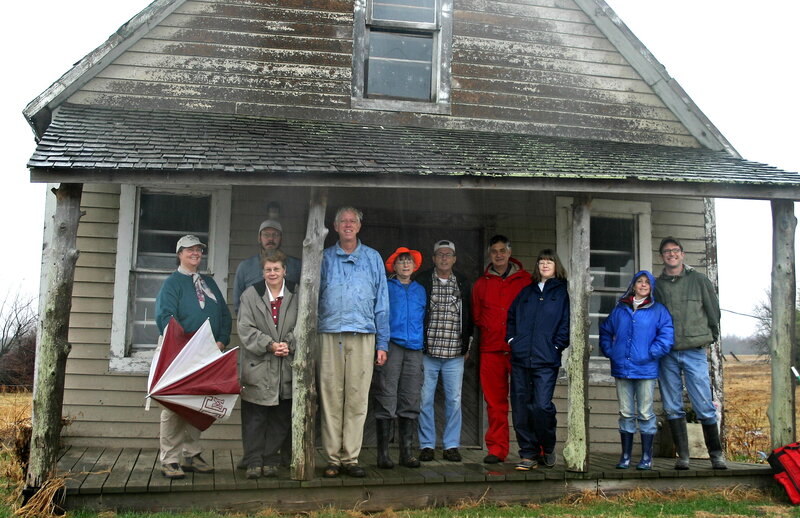 The motley group on the right is at the town of Bugtussle, Texas. It is a ghost town, just a large cemetery and this neat old store where we took our group photo. We had been collecting in the North Sulfur River and were wet, muddy, and tired. We did have a good time and found several nice things. I think that is what it is all about. We concentrate on finding things rather than buying them. This picture above is of the spillway at Lake Brownwood, and if you look closely, you will see our people all over the outcrop extracting the rare Pennsylvanian sea urchins with spines still attached. Click on the gallery to see why we look for them. We meet once a month on the 3rd Tuesday of the month at 7:30 PM at the clubhouse (see second picture at right). 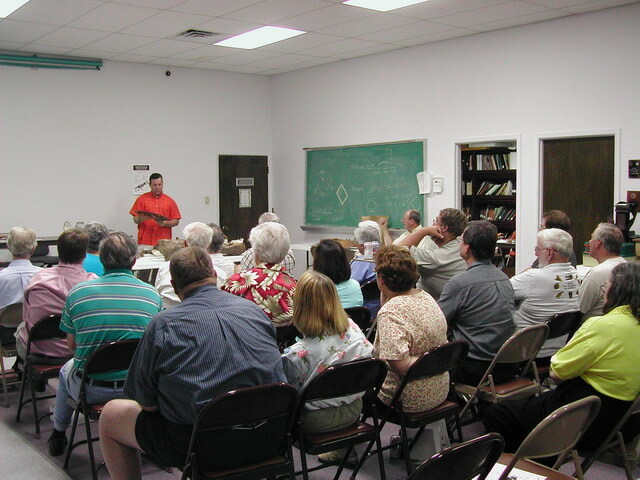 Typically the session begins with a show ‘n tell of things that people have found and that frequently leads into “stump the paleontologist” sessions where people seek help in identifications. Usually that is followed by a talk on some paleo topic, but we have had sessions where we learn new techniques like “coal ball peels” and thin sectioning fusulinids. A past holiday party (in July!) had a session where we made jewelry from inch-sized Moroccan ammonites ground to show the chambers. We are one of the Sections in the Houston Gem and Mineral Society which as an organization provides us with access to diamond saws and grinders and torches and furnaces where we sometimes turn our finds into jewelry or bookends. After you have collected a carload of petrified wood, you HAVE to do something with it. We teach how to prepare fossils in our shops. We have a dedicated air tools room with micro jackhammers (Aero and Microjack 5) and a Swamblaster micro sandblaster. Fossils need to be identified, and the Section has written identification guides for Texas Eocene Stone City Formation, Texas Cretaceous Ammonites, Bivalves, Urchins, Gastropods, and Texas Pennsylvanian Brachiopods which you may order. We also have described the Petrified Wood in the Herbert Zuhl Collection on display at the Houston Museum of Natural Science. Click on the PUBLICATIONS pulldown and click on PALEO BOOKS. We do outreach to the community in several areas. 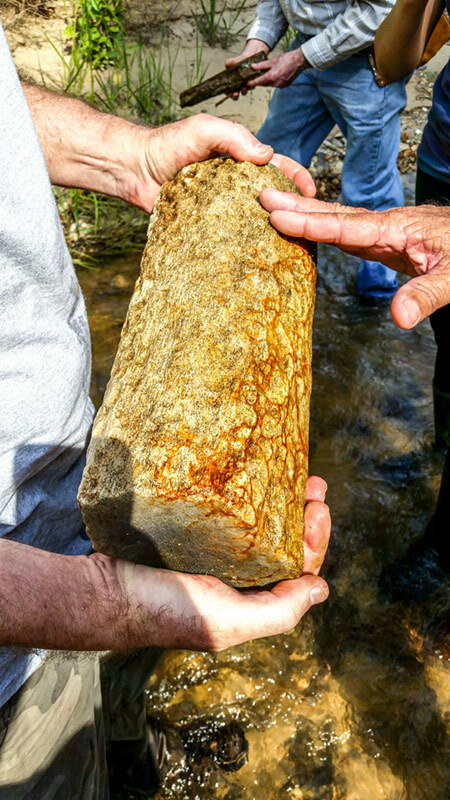 Talks at schools, libraries, Scout Geology Merit Badge programs, staffing paleo tables at our annual show, docenting at the Houston Museum of Natural Science, doing field trips for Earth Science Week, downtown building stones tours, and talks for sister rock clubs. 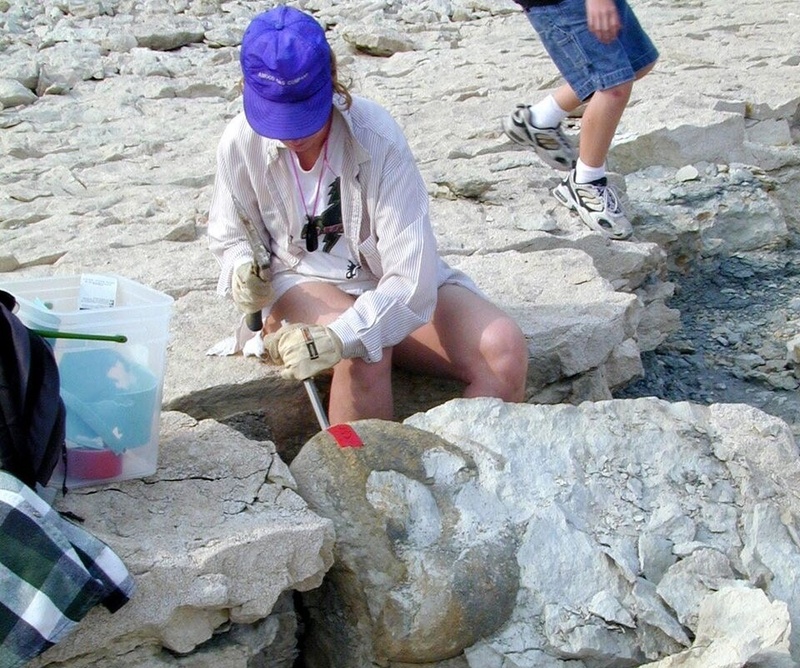 The Paleontology Section offers a $1000 scholarship each year to a student focusing on paleontology. Click on the EDUCATION pulldown and click on SCHOLARSHIPS for more details. Paleo Section President Neal Immega has had great success coaching Science Olympiad students. In 2014, his teams won 1st and 7th in the nation in the High School category for Rocks and Minerals. In 2015, his teams won 1st and 10th in the nation in the Middle School category for Paleontology. See our Outreach gallery. We have a 1700 volume library with everything from popular books on dinosaurs to the Journal of Paleontology. An Excel spreadsheet is here. To see our Field Trips page, click on the EVENTS pulldown and click on FIELD TRIPS to find some locations where YOU can collect and some others which you have to go to with our group. Current Section officers for the Section are President Neal Immega Ph. D. paleontologist, Field Trip Leader Mike Dawkins, and Treasurer Chris Peek.